I love the special features that come on a Blu-ray. Movies are incredible, but I love being able to dive into the behind the scenes of a movie and really learn what it took to make that movie. I love seeing the development of the story and learning why choices and steps were made. To me, the special features enhances a movie because you have the opportunity to learn more about the characters, story and bigger picture. I could spend hours watching these features and love all there is to learn. Last month, when I had the incredible opportunity to visit the Walt Disney Studios to celebrate the in-home release of Disney’s Frozen, Disney’s Pirate Fairy and Saving Mr. Banks. I had a once-in-a-life time opportunity to go deeper “behind the scenes” than the special features could ever take me. 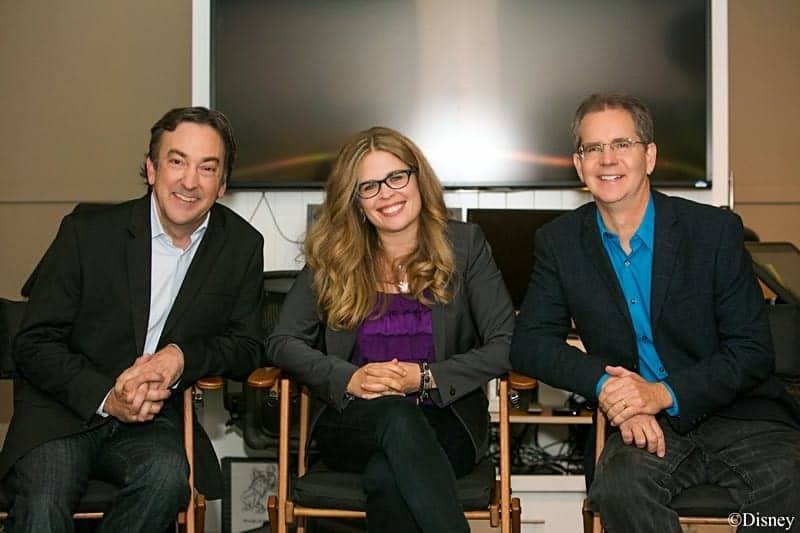 During this time, I had the opportunity to sit down with a group of bloggers and interview Peter Del Vecho, Jennifer Lee & Chris Buck, the makers of Frozen. 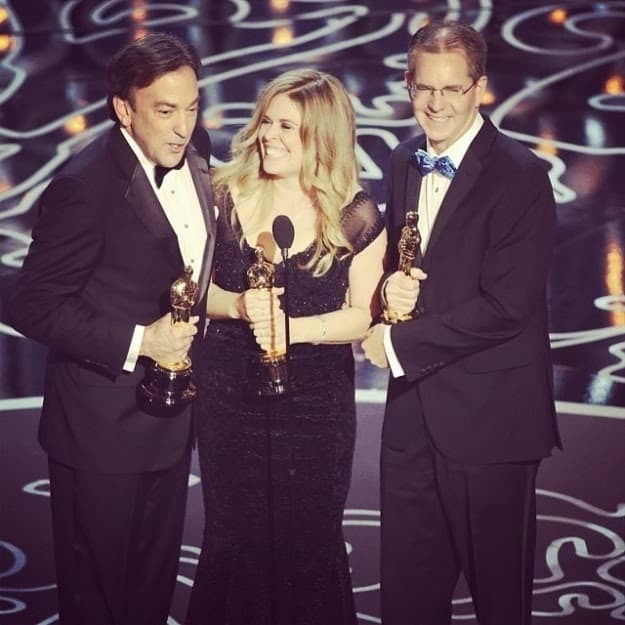 If you watched the Oscar’s, I’m sure you would recognize them from their photo above, because of the recent big win, with frozen winning best animated feature film. We loved this movie and it was a well deserved win! Q. I want to ask you about the ending and making it about sisters. A. The idea was how could we redefine what true love means. What we have done in the past geared to one audience and we want to figure out how could we do something different. The sister idea came in a little bit later. And that everybody loved that idea because emotionally the story became so much richer. I think what hit a lot of us. Because I remember hearing about it when I wasn’t on the project was that we had never seen it before. That we never felt such an emotional thing. The issue is we started realizing why we had never seen this storyline before. It was a really hard thing to earn. I mean that emotionally. So that when you get to that moment its surprising and satisfying and you are emotionally there. Its amazing in the store process, if you just lean too heavily one way or the other on a romantic story or a sister story it will fall apart. I think so much of our development for a year at least was the constant reworking and rebuilding, stripping away and starting new to get to that moment so I think that is why we talk about it a lot. Q. I love what you did with setting it up. You think its going to be a traditional love story that we have all seen before. And you think you know wher it is going, and then it gears off into another direction. It was just really fresh. A The challenge with that was to make Anna not so fickle. BEcause that was a big part of the problem where if there is Hans and Kristoff and Else and not lose faith in the sister relationship while you are sort of tearing it apart. Q. Do you have to bring more of your A game because you are relying on more of just a voice? Yes, there is that. The audition process is very important. Because that is when you can listen and find out if that voice going to be able to tell us a lot. Do they have all the colors in the voice that we need and to convey all that emotion. There are some great actors that we audition and the voices aren’t quite right for the character. What we don’t do in auditions is look at them. You have to look at a picture of the character or design to see if the voice fits. They are so charming on their own and a lot of them are pretty and handsome but we aren’t dealing with that. The interesting thing that I love about animation is discovering, because i’m newer to animation, that you really are directing twice because you direct the actors but then you direct the animators. We always say that animators are actors, they just do their acting with a computer or a pen. So they bring a lot of performance and thats what they love about the job. When we go, we try not to tell them specifically what to do, but we do things like, “she’s saying this but inside she is feeling that.” They love the challenge of making that digitally. Its a very strange thing when you actually get to experience. The film just grows and gets more and more real to you. The characters become more and more alive. We would always say when Kristen Bell came in, we would say, “Ahhh. Anna is in the house!” They bring so much to it. The other thing we do is we video tape their performance even though they are just in front of a mike. There are things that they will do facially and with their bodies that the animators can use if it seems to work. But its a tough process. I think it is tougher for them than it is for us. Because they are really working in this void, having to play off of us reading the lines to them or some other person there. Or once in awhile we will get the other actors in so they can play off each other. We were never able to get Kristoff and Anna together and in that scene when they are in the sled and they are going back and forth at each other, we did something different where she would improv and just throw stuff out there and then he heard her responses and was jumping back at it. We had never done that before where they were listening to their voice but we wanted that banter to be like it was really happening. That was so hard because the literally had to go at each other but were never together. Q. Where were Kristoff’s parents? I did just have a conversation with the Publisher group about wanting to know the backstory but I don’t know if they are going to go into that. We talked about that yes, he was an orphan and being a wild child liked to be on his own. There is a place he could have stayed. An orphanage that he probably was at for awhile, but he fled and preferred to be with Sven. But yet he was a little boy alone making his way so when Anna’s choice to be hyperactive that night and get accidently struck by her sister led him to the trolls and to his family. It was a kind of backwards way that Anna gave him his family. Q. Lets talk about the star of the movie– Olaf! You’ve made an icon. Olaf was not an easy one. He was always meant to be- Elsa created him when she was creating an army- and army of snowmen and he was the very first guard that she made and her powers weren’t all there yet. So we called Olaf the first “Pancake.” So, the other guards were like the marshmallow character we have in the movie. The big scary one. Olaf was like a reject, but she loved him. Thats where he started. He was funny but a little more sarcastic. Then we liked him, but he had to evolve. Then, when of course Elsa was not the villian and the two girls were going to grow up together, he was still there. He met Anna alater in the movie. We had to make Olaf have a purpose more than just funny. What is his real purpose in them movie? That was when the idea of two girls creating Olaf together when they were young and from that point, Olaf represents the good times that the girls had. When their relationship was good. When Elsa sang, “let it Go”, the first thing she did was the last thing she did when she was happy. They had built this snow man, not magical, but together. That was her happiest moment with Anna and then everything went bad. So when she starts Let it Go, she goes right back to the last moment that she was happy, and it was Olaf. So to us, he is in the magic of innocent love, of love that is pure and undamaged and not hurt by life yet. There is a piece of that love, the hope. When Anna finds him in the film, that is a reminder to keep going. I remember that we build a snowman. She made you, then she must feel me, she wants me to come. So it was a way to keep them tied when they weren’t. Disney’s Frozen will be available on March 18th in Blu-ray combo pack or you can preorder Frozen on Amazon.